Many, many years ago, man made the discovery that he could travel by water using the wind as power. Early man, using a fallen tree as a boat, found that if he spread an animal skin, or a mat of woven rushes, along two crossed tree limbs on the top of his primitive boat, the wind would move him along and he would not have to paddle. This man became the first sailmaker. Our history in sailmaking began in 1834 in a sail loft located at 44 South Street, New York. This is the present location of the US mint. This is where Louis Martin open his business and where he was to become the largest producer of quality sails in the world. In 1918, my great grandfather, Henry Ahrens took ownership. I don't know much about either of these two men as they died long before I was born. I do think that he was a tough teacher by what I was told. I remember hearing stories from my grandfather of how he started working in his father's loft. He and his five brothers and one sister each started at the bottom; with a brush and a dust pan. Pictures of the old sail loft taken after the conversion to electricity in the early part of this century can be found here. Henry produced sails for many famous ships. Probably none more famous than the "Thomas L. Lawson", the only seven-masted schooner ever built. 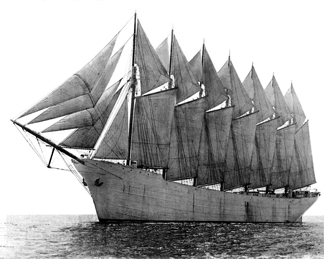 The total dry weight of these enormous sails was 18 tons. Tragically, she sank during a storm off the coast of Italy. When World War II broke out, all of Henry's sons went off to fight. Then, after the war, each of them settled across Long Island and each opened their own canvas shop. Two of them still exist today; Champion Sailmakers in Freeport, and Maritime Canvas in Lindenhurst. This was the beginning of the transition from making sails to making canvas for power boats. My grandfather, Bill Ahrens, was the man who opened Champion Sailmakers in the late 40's. First on Merrick Road, Then on Woodcleft Ave. He finally settled upon moving out to his new building on the beautiful Hudson canal. This was in 1954. We are at that very location today with very few changes made. Champion Sailmakers at that time served much of Long Island. It was fully staffed 24 hours a day with two shifts working during the summer season. Bill worked hard and he played hard as he also raced boats. He won dozens of trophies with his super fast race boat, the "Miss Champion Sailmaker". I learned this business from my grandfather and his brother, Kenneth Ahrens. Kenny (as we liked to call him) taught me the proper way make canvas tops. "Never skimp," he would always say. "These are boats, not toys to be taken lightly," he added. My grandfather, however, taught me something very important. He taught me the thought process behind the trade. He taught me that before any work begins on a boat, the first thing to do is to "see the finished product in your head". I live by those words every day. My name is Scott Southard. I work with my mother, Diana Fleischman. We are the 5th and 4th generation sailmakers who now own Champion Sailmakers. We were handed the reigns back in September, 1986. Since then, we have had the pleasure of working on so many interesting projects. For me, one of the more interesting boats I have worked on was the "Trans-Atlantic", the record holder for the smallest outboard motorboat to cross the Atlantic Ocean. A stabilizer sail was configured to aid the tiny boat on its journey. It was made the old fashioned way; out of good old heavy canvas. This was to be one of the last sails to leave our shop. The old zigzag sewing machines have been pulled from the table and retired. It's strictly power boat canvas for us from now on.